The foundations of SOF combat casualty care began with the Advanced Trauma Life Support (ATLS) Training Program. ATLS was established after a tragic plane crash in 1976 in rural Nebraska, which devastated an entire family. The pilot, an orthopedic surgeon, was seriously injured, while his wife was killed instantly. Three of his four children sustained critical injuries. This physician had to flag down a passing motorist to transport his children to the nearest hospital. Upon arrival, he found the small rural hospital locked. Even after the hospital was opened and a physician was called in, he found the emergency care provided at the regional hospital inadequate and often inappropriate. Once he returned to work, the physician, with assistance from advanced cardiac life support (ACLS) personnel and the Lincoln Medical Education Foundation, began to collate a set of protocols for the management of such patients and produced the initial framework for the national ATLS course. These protocols were adopted by the American College of Surgeons (ACS) Committee on Trauma (COT) in 1980. The original intentions of the ATLS courses, modeled on the ACLS program, were to train physicians and nurses who did not manage trauma routinely in the initial management of the severely injured patient. Several changes in the standard protocols used to treat trauma CAX were modified. Previously, a complete evaluation was performed; a diagnosis was made; and only then, was the casualty treated. The new approach was to establish a protocol to assess then treat the most life-threatening injuries first, and accordingly, move on to the next injury. The “ABCs” of trauma was established to prioritize the order of assessment and treatment. Nothing new was added; current evaluation procedures were simply reorganized to reduce morbidity and mortality in the “golden hour” of trauma. The ATLS pilot courses were introduced in Auburn, Nebraska in 1977. By 1980, these courses expanded nationally under the auspices of the ACS. Early reports on the implementation and evaluation of these pilot courses and the improvements in civilian trauma care appeared in the literature soon afterward. Since that time, ATLS has been accepted as the standard of care for the first hour of trauma management and taught to both military and civilian providers. In 1981, shortly after the development of the ATLS course, the ACS/COT and the National Association of Emergency Medical Technicians entered into a cooperative agreement to develop an ATLS course for prehospital providers. This course was appropriately named Prehospital Trauma Life Support (PHTLS). The first PHTLS course was taught in New Orleans in 1984. PHTLS is nationally endorsed and widely adopted as a continuing educational program by hospitals, educational institutions, emergency medical service agencies, and military medical programs and is incorporated into many initial and refresher emergency medical technician/emergency medical technician–paramedic courses. Until recently, U.S military medical personnel were trained to care for combat CAX using the principles put forth in the ATLS model. The inappropriateness of many of these measures when applied to combat CAX initiated the TCCC project by the U.S. Naval Special Warfare Command and was continued by the United States Special Operations Command (USSOCOM). USSOCOM developed a new set of tactically appropriate battlefield trauma management guidelines in 1996. 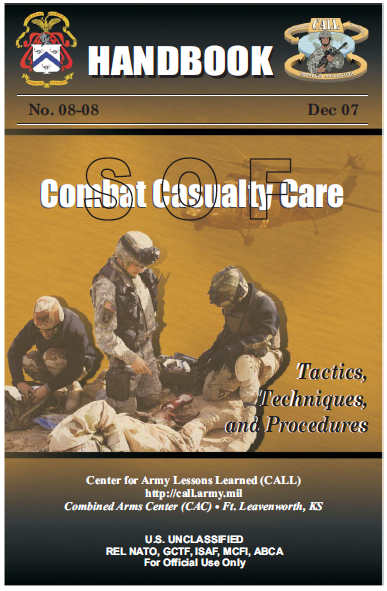 These guidelines focus primarily on the most common causes of preventable death on the battlefield and the most protective measures that can be reasonably performed in combat, taking the special operations tactical environment and the unique patterns and types of wounds into consideration while developing casualty management recommendations. TCCC guidelines, used in special operations since 1998, have proven successful in combat operations. In 2001, USSOCOM recognized the need to update these guidelines, and based on research conducted by the Naval Operational Medical Institute, a Committee on Tactical Combat Casualty Care (CoTCCC) was established. This committee updated the TCCC guidelines in 2003 and republished them in the revised PHTLS manual, 5th edition. CoTCCC is an ongoing project conducted under the sponsorship of the Navy Bureau of Medicine and Surgery. The unique aspect of this joint organization is that it includes special operations personnel, including special forces medics, Navy SEAL corpsmen, Air Force pararescuemen, trauma surgeons, emergency medicine physicians, anesthesiologists, and medical educators, who collaborate to continually update TCCC guidelines. TCCC was established as the standard of care for special operations medic training in 2005. TCCC equipment and training also became mandatory for all deploying SOF, as the first responder to a wounded special operations warfighter on the battlefield is often not a special operations medic. Since World War II and the war in Vietnam much of the decline of combatants killed in action (KIA) can be attributed to TCCC training, techniques, and equipment. SOF combat casualty care applies to all special operations components and the full range of military operations involving the integration of special operations assets conducting special and irregular operations in a joint, combined, or multinational environment. SOF combat casualty care is the medical management provided to CAX in a tactical, combat environment. This medical management is often in contrast to CF, with its robust logistics tail, its focus on stabilizing the casualty, and the rapid rearward movement capability to advanced hospital trauma care. • Enemy fire: This may prevent the immediate management of CAX at the point of injury (POI) or wounding and may place the combat lifesaver (CLS)/medical personnel at risk while providing care to CAX. • Medical equipment limitations: CLS/medical personnel are generally limited to what they are carrying in their CLS kit or medical aid bag. • A widely variable evacuation time: In the civilian community, evacuation is generally under 25 minutes; in a combat situation, it may be delayed for several hours. • Tactical considerations: Tactical constraints that may take precedence over medical care and the timely evacuation of CAX. • Casualty transportation: CASEVAC may or may not be available. Air superiority must be achieved before any air evacuation assets will be deployed. As stated previously, the tactical situation must dictate when or if CASEVAC can occur. Additionally, there are environmental factors that may prevent evacuation assets from reaching CAX. Note: The ongoing and evolving process to standardize terminology is evident when using the terms medical evacuation (MEDEVAC) and casualty evacuation (CASEVAC) within the CF and joint SOF arena. The Army Medical Department (AMEDD) uses the term MEDEVAC when referring to the evacuation of CAX using dedicated, standardized medical evacuation platforms, with medical personnel providing en route care. CASEVAC, according to the AMEDD, is reserved for casualty evacuation by non-medical vehicles, watercraft, or aircraft, with or without en route medical attendance. In the SOF arena, evacuation of CAX will often be accomplished by other than dedicated U.S. Army aeromedical or special operations forces aircraft. U.S. Air Force (USAF) may also perform this extraction of the team and CAX. USAF reserves the term MEDEVAC for the aeromedical evacuation of stable patients from one medical treatment facility (MTF) to another. SOF are advised to avoid the term MEDEVAC when discussing the initial management of combat CAX and use the term CASEVAC instead to eliminate any misunderstanding of the mission required. This publication will use the term CASEVAC throughout to denote the evacuation of CAX by ground vehicle, watercraft, or aircraft assets. • Penetrating traumatic brain injury (TBI). Most of these cases are not survivable, and these CAX are triaged as expectant. areas, such as the axillary region, still occurs and is frequently not survivable. Penetrating wounds to the abdomen, without significant vascular involvement, may be survivable for several hours. • Potentially correctable surgical trauma. • Exsanguination; hemorrhage from extremity wounds remains the leading cause of preventable death. Extremity wounds account for over 60% of all wounds on today’s battlefield. • Mutilating blast trauma. These horrific wounds are not usually survivable. Improvised explosive devices (IEDs)/vehicle-borne IEDs (VBIEDs) are the leading cause of morbidity and mortality in OIF/OEF. • Tension pneumothorax (PTX). This is the second leading cause of death on the battlefield. Penetrating chest trauma still exists, even with the advent of body armor, and can become rapidly fatal without timely medical intervention. • Airway obstruction/injury; the third leading cause of preventable death. While this is a small percentage, mostly due to maxillofacial trauma, these injuries require immediate attention to ensure survivability of CAX. • Died of wounds, mainly due to infection and shock. The primary types of wounds caused by weapons are penetrating, blast, and thermal trauma. Unlike the civilian community where the majority of wounds (70%) are blunt trauma in nature, usually from motor vehicle crashes, the majority of wounds in combat are caused by penetrating injuries from bullets (23%), shrapnel injuries (62%), and blast injuries (3%). Secondary debris is also frequently associated with these types of penetrating wounds. Note: IEDs/VBIEDs have caused about half of all American CAX in OIF and about 30% of combat CAX in OEF, both KIA and wounded in action. Exsanguination, PTX, and airway obstruction/injuries are significant because they are potentially avoidable with appropriate medical management and intervention using SOF combat casualty care principles and techniques. In fact, it is estimated that of all preventable deaths, 90% might be avoided with the simple application of a tourniquet for extremity hemorrhage, rapid management of a PTX, and the establishment of a viable airway. • Care under fire: The care rendered by the special operations warfighter, CLS, or special operations medic at the POI while they and CAX are still under effective hostile fire. Available medical equipment is limited to that carried by the individual warfighter, CLS, or special operations medic in their medical aid bag. • Tactical field care: The care rendered by the CLS/special operations medic once they and CAX are no longer under effective hostile fire. Tactical field care also applies to situations in which an injury has occurred, but there is no hostile fire. Available medical equipment is still limited to that carried into the field by medical personnel. Time to evacuation from the POI or other casualty evacuation point to an MTF may vary considerably, from a few minutes to many hours. • Combat CASEVAC care: The care rendered once CAX have been picked up by an aircraft, vehicle, or boat and transported to a higher level (echelon) of care. Additional medical personnel and equipment may have been pre-staged and made available at this stage of casualty management.